so yes, this might be a very brief post, because we want to talk about an amazing artist from Venezuela, that perhaps not many of you know. 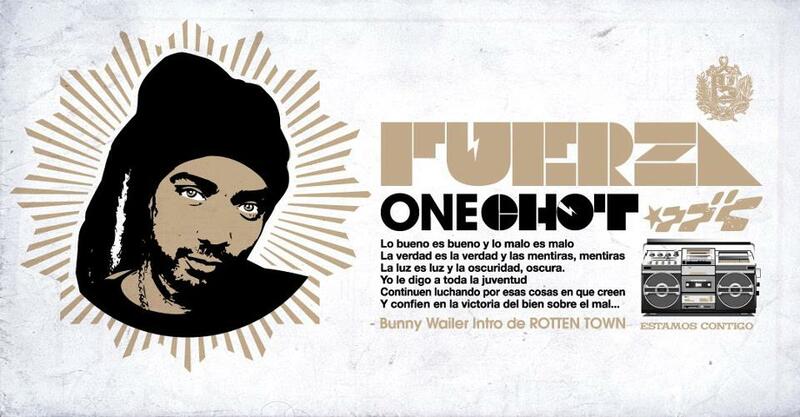 One Chot, he is a reggae/hip hop/urban Icon not only in Venezuela, but all over Latin America, and to be honest, I (caballo) have always feel a HUGE admiration for him. because this great artist who is not my own friend, (although he is very close to many of my good friends) has been shot. The good news is he is alive, although there haven’t been many details on how’s he doing, more than he is in a critical condition and still very stable. And like in a horrible prophecy he sang about the absurd violence Venezuela was going through, to be a victim of same violence which is leading us to doom. Again I had never written a post like this..so excuse me if I am a bit emotional. – One chot no es mi amigo personal, jamas he hablado con el, pero su musica y sus letras me acercaron a el, su vibra y su flow son de mi total admiracion, y para mi el es una gran influencia, un visionario, y gracias a que tenemos muchos amigos en comun, me doy cuenta que un gran ser humano. Mis plegarias y energia van para su Familia y amigos; que Dios lo ilumine y lo ayude en este momento. Y a la gente en Venezuela, haganse sentir, carajo!! Esto no puede ni debe caer en ese circulo de impunidad. Tu canto suena por todo el planeta!! !